Diane Patrick, the wife of Governor Deval Patrick, is being treated for exhaustion and depression, the governor's office announced last night in a statement. The governor "will work a flexible schedule for the next few weeks in order to spend more time with her and his family," according to the statement. Aides to Patrick declined to say whether Diane Patrick had been hospitalized or had suffered from depression or exhaustion in the past. "The family asks for the prayers and understanding of the public," the statement read. "We also ask respect for the family's privacy at this difficult time." A partner at the Boston law firm Ropes & Gray, Diane Patrick, 55, said last November that she intended to be more prominent publicly than previous gubernatorial spouses. But she acknowledged she was unsure how to balance the new demands with her legal career. Following appearances during his inaugural in early January, she has not been highly visible. It was not immediately clear how much time Patrick would be spending on state business in coming weeks and whether the announcement would trigger a more prominent role for Lieutenant Governor Timothy P. Murray. A source with knowledge of the situation said that a plan would be worked out within the next 24 to 48 hours. The announcement comes after a difficult week for the new administration, dominated by questions about the governor's call to a financial institution on behalf of a controversial subprime lender, on whose board Patrick once sat. The miscue, the most serious in a series of gaffes since Patrick took office, triggered a mea culpa from the governor and a plea to the public not to lose faith in him. Diane Patrick was an asset to her husband during his campaign, and was a favorite of his political supporters. She was also viewed as a new model for political spouses, given her résumé of high achievement and her obvious partnership with her husband. "She's a terrific woman with a very strong marriage," said Philip Johnston, chairman of the Massachusetts Democratic Party. "She's a warm, caring person who played a key role in his election. 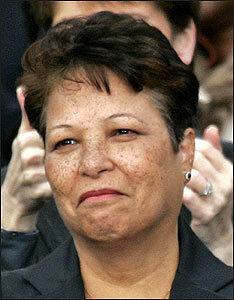 She was very active in the campaign and at least as popular as Deval." The governor and his wife appear extremely close. When Patrick was interviewing a candidate to become his top political strategist, he told him he only had one rule when it came to the campaign schedule: Friday is date night with Diane. He also said recently he was in the "dog house" for not being sufficiently attentive on her birthday. After her husband's election victory in November, Diane Patrick said she was not sure how to handle her new role as governor's wife . The day after the election, she conducted a conference call for work as her doorbell in Milton was ringing regularly with flower deliveries to congratulate the Patricks on the victory. "I almost feel like I should go out and try to find a book, 'First Ladies for Dummies,' " she said in an interview the day after the election. "The people I've asked who seem to have some sense of it say, 'Look, this is something you have to figure out on your own with Deval.' "
A spokesman for Ropes & Gray declined to comment last night on whether she has taken a leave of absence. Patrick's first months in office have been tumultuous. He has drawn criticism for the luxury Cadillac he chose as his official vehicle and the $27,000 worth of furnishings he purchased for his corner office. He has since repaid the state for the furnishings and will pay a portion of the lease payment on the car each month. Patrick was also criticized when he hired a $72,000-a-year aide for his wife. His administration said the position was necessary given the volume of speaking requests Diane Patrick was receiving. Last night, Patrick spokesman Kyle Sullivan said the aide, Amy Gorin, would continue to work on "research, policy, and scheduling in the governor's office." Political observers said it was an extraordinary decision for a chief executive to take time away from his duties for personal reasons, especially at such a critical juncture. Patrick is just nine weeks into his term and was expected to spend the coming month lobbying lawmakers to sign on to key portions of the $26.7 billion budget he released late last month. Most politicians try to give the impression of invincibility, even when they're struggling with personal challenges, said Jeff Berry, a political science professor at Tufts University. "So I think that this is unusual and I think shows some character on the part of the governor and an acknowledgement that state government is a lot larger than he is," Berry said. "And I think it's important that Diane Patrick went public with this, because it's easy to hide. Who would know?" Kitty Dukakis, wife of former governor Michael Dukakis, has been outspoken about her long battle with depression during and after her husband's political career. After her husband lost the 1988 presidential election, she later wrote, she struggled with alcohol and with bouts of depression that returned every year. She detailed her successful experience with electroshock treatments last year in her book, "Shock: The Healing Power of Electroconvulsive Therapy," which was co- written with former Boston Globe reporter Larry Tye. She turned to electroshock treatments in 2001 because antidepressants and talk therapy were not helping, she wrote. "Let me tell you, it's been a miracle in Kitty's life," Michael Dukakis, who now teaches political science at Northeastern University, said in an interview after she went public with her struggle. "I cannot tell you what a difference it's made in her life, in the lives of those of us who love her." Dr. Maurizio Fava , director of depression treatment at Massachusetts General Hospital, said that 5 percent of Americans are suffering from a major depressive episode and almost 1 in 5 people will experience depression at some point in their lives. Fava said that while he did not know what had caused Diane Patrick's depression, he said extreme stress is a common trigger, even when the cause of stress is positive, such as Deval Patrick's election as governor. "Change can be stressful regardless of whether it is positive or negative," he said, "because it involves adaptation to a different situation." "Fatigue is a very common symptom of depression," he said, adding that a tendency to suffer from depression commonly runs in families, including a tendency to slip into a major depressive episode -- which means being unable to function fully for an extended period -- when under stress. Greg Simon , a psychiatrist for Group Health Cooperative in Seattle and chairman of the scientific advisory board of the Depression and Bipolar Support Alliance, said twice as many women as men are treated for depression, but statistics show that the affliction affects racial and ethnic groups more or less equally. "Someone prominent being treated for depression is not new -- what is new and laudable is someone prominent being public about being treated for depression because that helps remove the stigma and helps other people get treatment for themselves," Simon said. Lisa Wangsness can be reached at lwangsness@globe.com. Scott Allen and Andrea Estes of the Globe staff contributed to this report.